Here it is, my newest pattern. 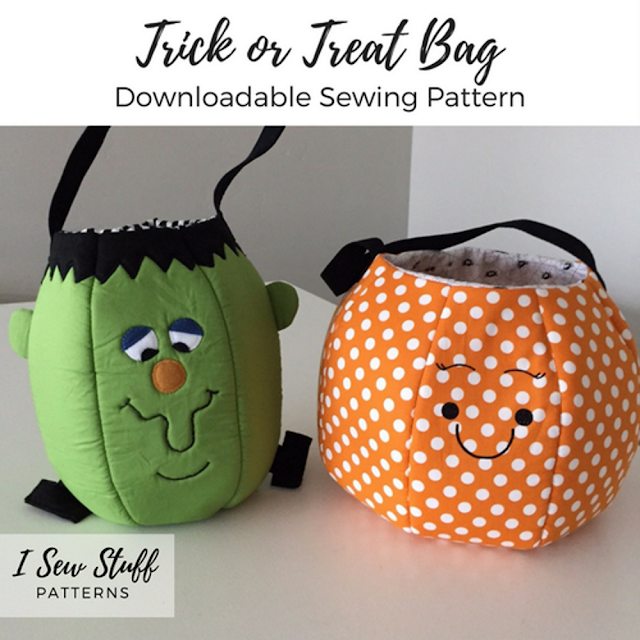 It's a digital PDF downloadable pattern to sew a unique and handmade Halloween Trick or Treat bag. It can be completely personalized, use your own creativity! The possibilities are endless. The pattern includes 2 views, an oval monster or a round pumpkin. Faces can be appliqued and embroidered (by hand or machine). 3 styles of faces are included on the pattern or use your imagination to create your own. Heat transfer material and a cutting machine (like a Silhouette or Cricut) is a fun option for making the face uniquely yours (2 PNG files for turning pumpkin faces into cut files ARE INCLUDED with the purchase of the pattern). Both views are made with quilt weight cotton for the exterior and lining. Foam is used to give the bag it's shape. It's sturdy design will help you sew a bag that will last through the years. This sewing pattern includes 23 pages of detailed written instructions with full color pictures to walk you through each step in the construction process. Contact me if you get stuck, I’m happy to help! There are 9 pages of pattern sheets that you print and assemble to get the full-size pattern pieces needed to make this adorable bag. All sewists will love the professional results that come from using this pattern. Find the PDF pattern in my etsy shop.